May 25, 2016 by Matthew Rossi. It is important to understand how all this works. We will use two wireless access points to connect to each other to create a point-to-point WiFi connection. Although in our case we are using 2.4GHz models, this setup can be done with 5.8GHz models as well. 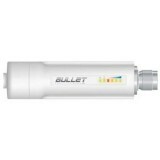 Each of these units has a WiFi radio and a high gain antenna which makes these units powerful enough for a mile or more of line of sight wireless transmission. One radio is configured as the Access Point, which sends the WiFi signal that is discoverable as a SSID or available wireless network. The other radio is configured as a Station AP that acts as a receiver station or client on the wireless network. Once the two radios are talking to each other, you have a PTP (Point to Point) wireless link. At the Access Point Side, our setup is geared toward making it possible for the NVR recorder to communicate wirelessly to the cameras located on the Station AP. 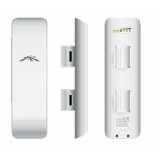 We connect the Access Point to our router or switch to which the NVR is also connected. At the Station AP, we can connect one camera directly to the radio, or mutliple cameras to the radio by using a switch in between. We don't recommend using more than 4 cameras per AP, otherwise you will clog your wireless connection with more data than it can handle. Using IP cameras makes it easy to make any type of camera wireless and tie it back to the same recorder where other wired or wireless ip cameras are connected. If you use our Tribrid DVR you can even connect other types of cameras that use coax cabling and use wired IP cameras, wireless IP cameras, analog CCTV cameras, and HDCVI HD over coax cameras. Once you have your cameras streaming back to your security video recorder, you can even do port forwarding and make your camera or NVR accessible for remote viewing from the outside world. Let's begin with the setup of configuring one IP Security Camera to wire into the Station and send the signal back to the 2.4GHz Wireless Outdoor Access Point. A command prompt like the following will appear. Type ipconfig in the windows command prompt and press Enter. 2) Locate your computer IP address and router IP address in the output from the ipconfig command. You may need to change the IP addresses of either one or both AP if there is an IP address conflict or they don't fit your network. 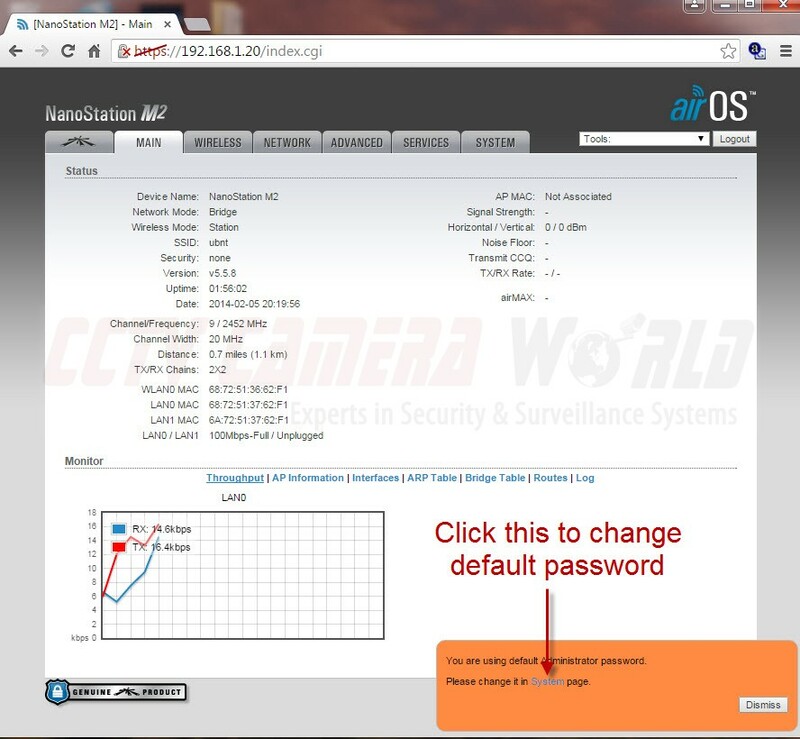 You can follow instructions provided in How to view IP Cameras from a web browser on how to change the camera's IP address. 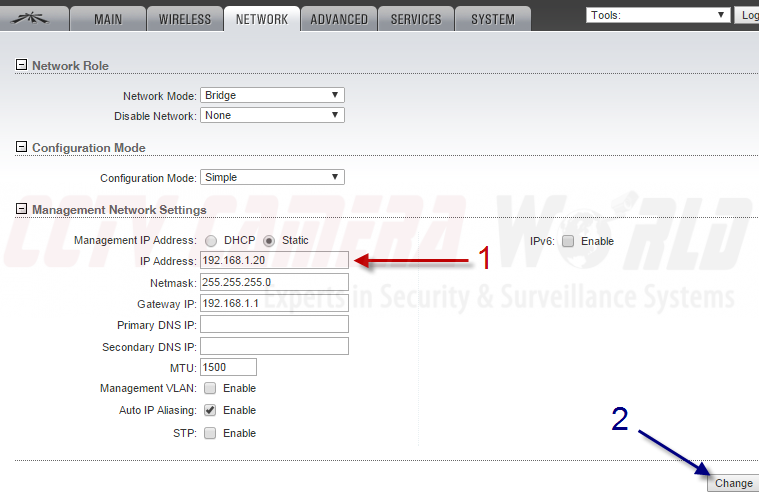 You can also find instructions on how to change the IP address of the access point here. 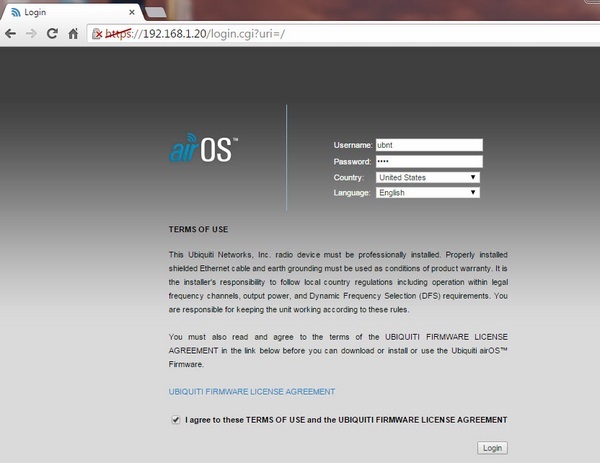 The default IP address of Ubiquiti radios is 192.168.1.20. Be sure you are using a compatible network, and enter this IP address into the address bar of your web browser. If you do not see the login page and get a security error message, follow the instructions provided in the image below. We are using Chrome as the browser in this case. The login page should look like the one below. The default username and password are ubnt and click on the checkbox on the bottom of the page before pressing login. After you log in for the first time you will be prompted to change the default password. On the bottom right side, there will be an orange colored dialog box. Click on "System" there to navigate to the page to change your password. Enter the old password and the new password on this page now. In addition, before saving changes set the Time Zone. When you're done click on the CHANGE button to save your changes. To properly configure two wireless access points to communicate to each other, you have to configure one as an Access Point and the other as a Client Radio. First we will set the Access Point which will transmit the WiFi signal. a) Click on the WIRELESS tab located on the top of the admin page to navigate to the page that allows you to configure radio settings. Take a look at the image below to see how we have configured the radio. Make sure the Channel Width is set to 40 MHz. 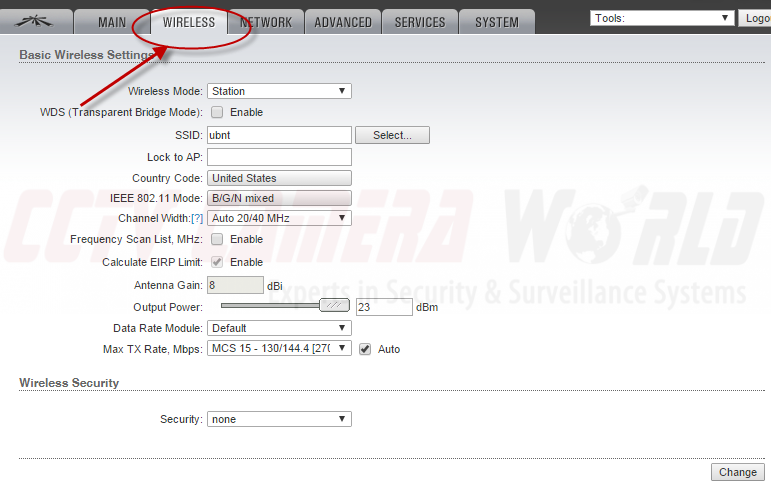 Ubiquiti Wireless Access Point Configuration Settings for radio set as PTP Access Point, with WiFi security enabled. Once you have selected all the settings, click CHANGE on the bottom right, and then look for the blue bar on the top to appear and click APPLY. Otherwise, your settings will not be saved. As of May 2016, almost all of the wireless AP in the supply chain for new products are MIMO enabled. Which means you can only access them with another MIMO enabled access point or laptop. Since you are going to be using another identical AP to receive the signal, then, of course, you want to leave it on. Since we haven't defaulted the device first, let's check to make sure it's on. Now the AP is configured to be used as the WiFi signal for another MIMO device only. Let's proceed to configure the IP address. 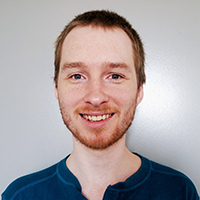 Given that we have multiple radios that are by default on the same IP address, we have to change the ip address before connecting the next device or there will be a conflict trying to access on the default IP. * Octets are separated by a decimal point. The fourth and last octet in the 192.168.1.20 address is the number 20. Once you've changed its address click on CHANGE, and if a blue bar appears on the top, click APPLY. We set our AP's ip address to 192.168.1.95 (not shown). The AP will reboot, and your browser should be redirected to the new address of the radio. 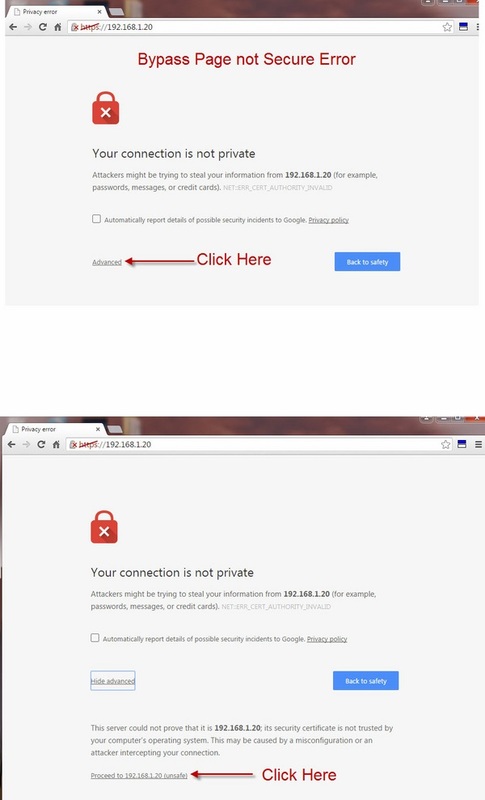 If it isn't manually enter the new IP address in your browser. Configuration of this AP is complete. Leave it plugged in and attached to the network at its location for now. While the AP is still attached to the network and powered, let's configure the second radio as a Station. Follow steps 2-4 on to access the station and change the password, and set the correct time and time zone. Now that the station is pulled up and the password is changed click on the WIRELESS tab at the top of the page. With all of these settings configured as described above, press the SELECT button located on the right of the text area for SSID. You will be brought to a menu like the one below. Select your unique SSID from the list given. Click on the radio button to the left of your SSID, then click LOCK TO AP. This station radio is now almost paired to work with that specific AP. The SSID and MAC address of the AP will be populated into the form as shown below. Now select the security encryption type, authentication type, and type the WiFi password you created for the WiFi signal on the AP in Step 5. When you're finished and your Wireless page looks like the above, click on CHANGE then APPLY at the top if it appears. 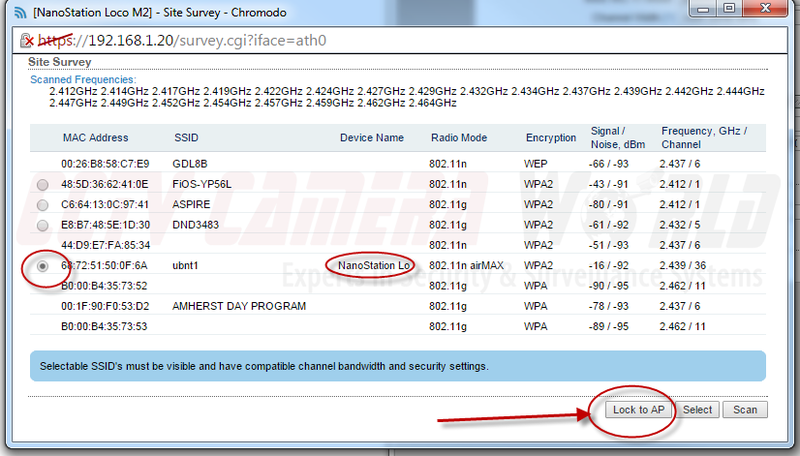 Once you've finished that you'll need to change the IP address on this Station AP too. 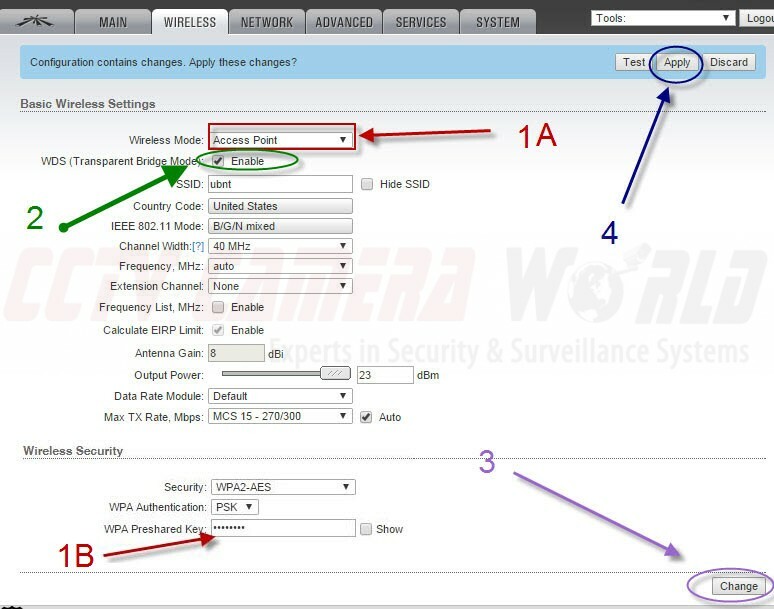 Follow step 7 for changing the IP address. We set ours to 192.168.1.96. Signal meter located on back of access point provides indication of whether 2 radios are correctly paired. If you have questions, feel free to drop a note in the comments section below. 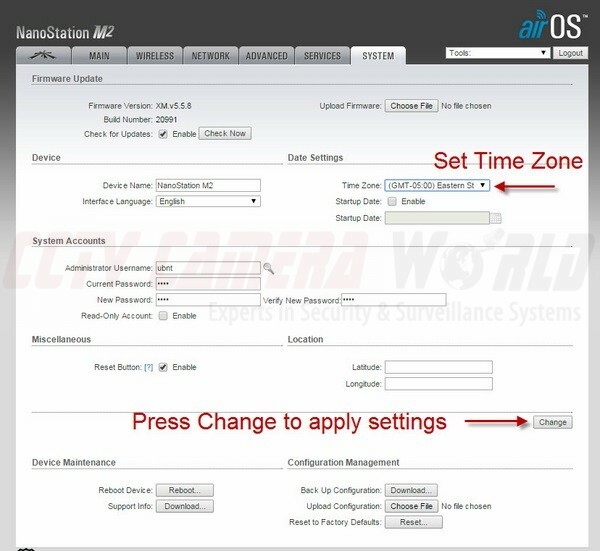 Tagged in wireless ip camera setup guide, ubiquiti access points. Best diagram and explanation I've found for this configuration!However, I am having trouble understanding the connection back at the NVR.1. Is the Router/Switch in the diagram the primary router connected to the internet? If not how is the NVR connecting to the Internet?2. 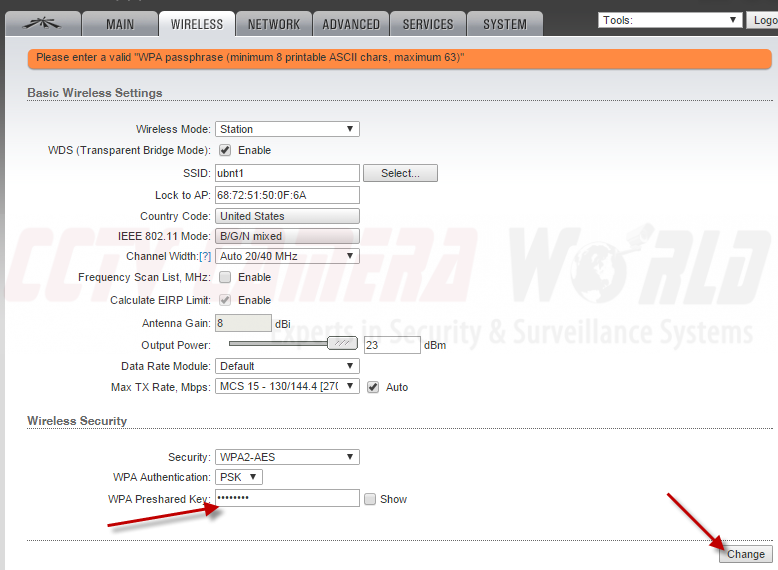 Assuming the router is connected to the internet the WAN port on the NVR is connected to the Router and the AP is also connected to the Router. So once the cameras are deployed remotely there is nothing plugged into the ports on the NVR, is that correct? 3. Once the cameras are deployed remotely over the AP network does the NVR have to be set up with any special configuration or will it just recognize the cameras ip addresses, that you set up prior to deployment, and display on the NVR monitor?Thanks for any help you can give me for clearing this up! Hi Bruce.1) The router gets connected to the internet. 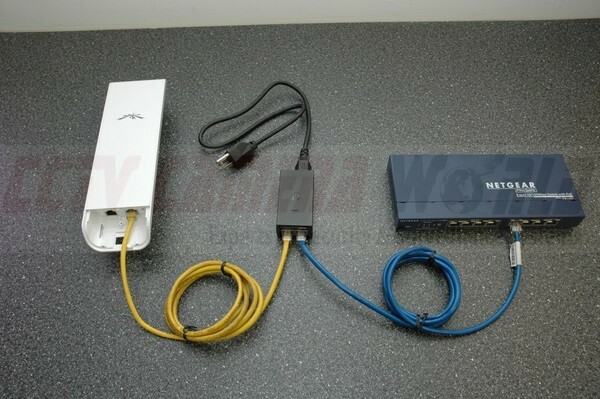 You would connect the network cable coming in from your ISP in to the WAN port of the router.2) If you are simply following the setup depicted in the diagram for connecting one or two wireless cameras, with one AP connected to the same router as the NVR, then yes nothing else is needed to make the wireless connection happen except as depicted. 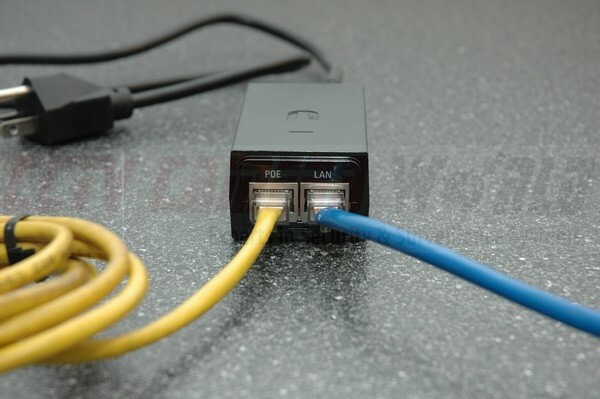 If you purchase a PoE NVR, you could connect hardwired PoE cameras to the NVR to have both wired and wireless cameras.3) If you have the cameras, wireless radios, and NVR set to specific ip addresses to work with your router's ip address scheme, then if you are using our cameras and nvr, it will find them. But that is still not always the case. You can also use the manual add function to add ip cameras on the NVR if its auto discovery function does not find the cameras. 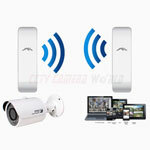 Meaning you can setup a system with mixed wired and wireless cameras. They don't all have to be wireless.